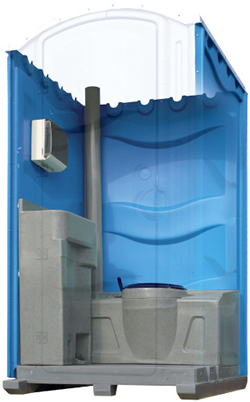 Portable Toilet with recirculating flush style tank operated by means of a hand pump. Large Health & Safety compliant sink, designed for full forearm immersion and foot operated for optimum efficiency. Event portable toilets omit the sink and contain an antibacterial hand cleansing gel. Wedding loos have hot wash sink, mirror and light. A 110v power supply required for hot wash loos. • All Meridian units that require electrical connections are certified with a full Electrical Test Certificate conforming to BS 7671, I.E.E. Wiring Regulations Act (amended) 1997.